You are here: Home / Common Cures / What is Parkinson Disease? The answer to the question, “What is Parkinson Disease?” is quite complex because this disease is a neurological disorder. Parkinson Disease or Parkinson’s Disease (PD) is a progressive disorder that generally affects older individuals aged 50 years or more. Males are more likely to suffer from this disease as compared to their female counterparts. Parkinson Disease is caused by the degeneration of brain cells that produce dopamine thereby resulting in the loss of dopamine, a brain signaling chemical or neurotransmitter. This nerve degeneration takes place in the region of the brain that controls body movements. The depletion of dopamine in turn causes malfunctioning in other areas of the brain as well and eventually results in widespread brain dysfunction. Healthier individuals also go through normal nerve degeneration but at a much slower rate as compared to the patients suffering from Parkinson Disease. It is not a contagious disease. The exact cause as to why this excessive degeneration of brain cells takes place is not known. Still, it is believed that Parkinson Disease could be caused by a combination of genetic and environmental factors. Environmental factors include factors like viral infections or intake of certain drugs with toxins that facilitate the process of degeneration. These factors tend to cause Secondary Parkinson’s disease or Parkinsonism. Other factors such as alcoholism, exposure to herbicides and insecticides may increase the risk of developing Parkinson Disease. The symptoms of Parkinson Disease are mild but they tend to worsen with the passage of time. Tremor in the limbs is one of the most important symptoms of Parkinson Disease. This shaking or trembling could occur in the hands, legs, arms, jaw, face or head. Tremors usually involve only one side of the body in the beginning of the disease. They are generally present in the resting state of the limbs. Other symptoms include rigidity or stiffness of the limbs, slowness of movement (bradykinesia), postural instability and loss of balance and coordination. With the passage of time, this chronic disease may give rise to problems like speaking softly, monotone, difficulty in chewing and swallowing, trouble in walking, speaking, smiling etc. Non motor symptoms like cognitive changes, sleep disruption, drooling, urinary problems, sexual problems and depression may also develop with the progression of the disease. It is difficult to diagnose this disease accurately. Thus, the diagnosis of Parkinson Disease is done on the basis of neurological examination and the medical history of the patient. Blood, tests, laboratory tests, and brain scans may also be required in order to rule out the possibility of other diseases. 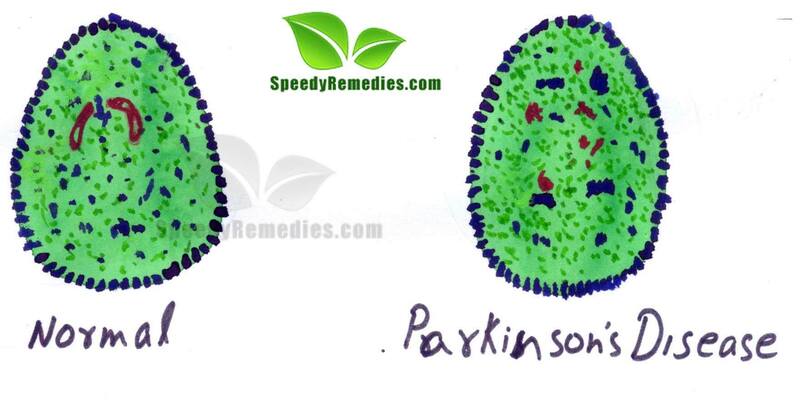 At present, there is no specific cure for Parkinson Disease. Though, there are number of conventional as well as home remedies that can be useful in providing relief from the symptoms of this disease. In certain cases, surgical treatments like Pallidotomy or Deep Brain Stimulation (DBS) may also be required Therapies like speech therapy, occupational therapy and occupational therapy are also beneficial in dealing with Parkinson Disease.